October 31 is Reformation Day. 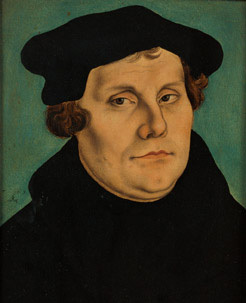 On that day in 1517, Martin Luther posted his 95 objections to the Roman Catholic Church on a church door in Germany. As a civics lesson, students of all faiths and no faith should understand the freedom of religion they enjoy because of what Luther started. Understanding the benefits of America's religious heritage to our civic life is important. Part of the American value system, rooted in Christian thinking, is that people not only have the freedom to hold to their religious beliefs, but to live by them and express them publicly, as well. In 1517, Luther had no intention of leaving the Catholic Church. But, holding fast to his conviction against certain church practices and doctrines got him expelled. At the time, governments in Europe enforced religious conformity for the Church. Luther wrote about why government authority should not be used to coerce belief. He argued, from Scripture, that each person is responsible only to God for his religious beliefs. To make his case, he quoted Jesus' statement in Matthew 10:28, "Do not be afraid of those who kill the body but cannot kill the soul. Rather, be afraid of the One who can destroy both soul and body in hell." "Surely that [Matt. 10:28] is clear enough: the soul is taken out of the hands of any human being whatsoever, and is placed exclusively under the power of God. Now tell me this: would anyone in his right mind give orders where he has no authority?...It is impossible and futile to command or coerce someone to believe this or that." Luther's revolutionary thinking about religious freedom spread throughout Europe and came to America with the Pilgrims, the Puritans, and eventually, America's Founders. Thomas Jefferson echoed Luther's thinking when he wrote the Virginia Statute for Religious Freedom. With the help of James Madison, it became law in 1786. Before this, Virginia taxed people to support churches. "Whereas Almighty God hath created the mind free; that all attempts to influence it by temporal punishments or burthens [burdens], or by civil incapacitations, tend only to beget habits of hypocrisy and meanness, and are a departure from the plan of the Holy author of our religion, who being Lord both of body and mind, yet chose not to propagate it by coercions on either, as it was in his Almighty power to do." Every student in America needs to understand the Christian roots of the freedom of religious expression they might take for granted. Students will not seek to preserve what they do not cherish, and they will not cherish what they do not understand. October 31 - Reformation Day - is an excellent opportunity to teach a civics lesson about the connection between Martin Luther, religious freedom, the Bill of Rights, and their everyday lives. Older PostTeaching without Fear, Part 11: Must You Give Equal Time in the Classroom to All Religious Holidays?